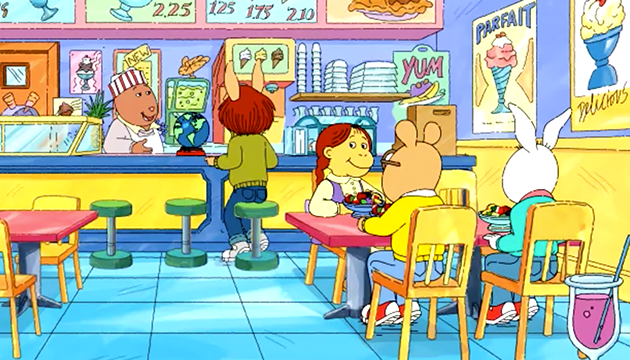 Arthur, Ladonna, Muffy, and Buster sat in Brain's ice cream shop. 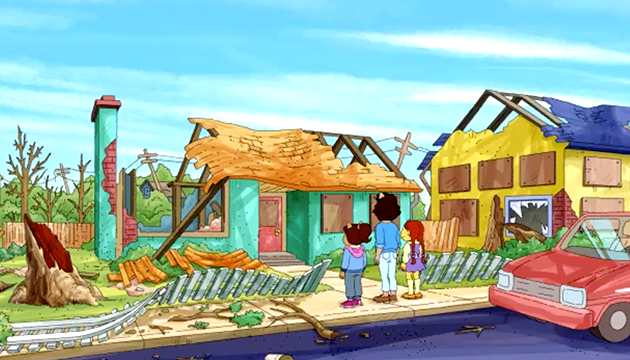 They were all talking about Hurricane Sadie, which was headed right toward Elwood City! Brain was looking forward to doing some experiments during the storm. Ladonna was less excited. "We had a couple hurricanes back in Louisiana," she said, "and all I can say is: be prepared." 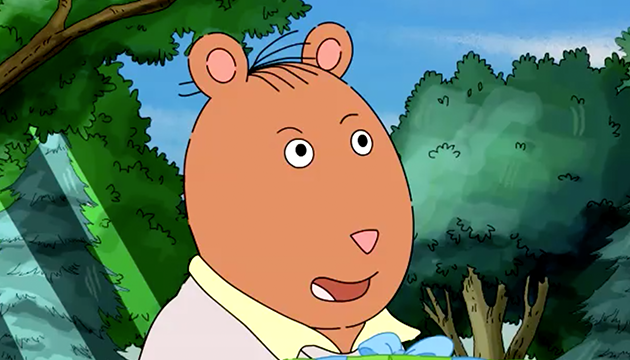 "Speaking of being prepared," Arthur said, "we'd all better get home." That evening, as the hurricane howled outside, Arthur and his family watched television. "The strongest winds will just miss Elwood City," said the weatherman, "but we will get a lot of rain." Just then the lights went out, then came back on. "Aaaahh!" yelled the kids. 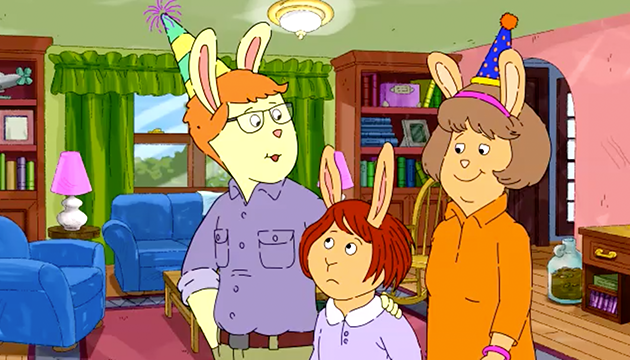 Arthur turned to his mom. "Will we be okay?" he asked. "Don't worry. We're safe," said his mother. "Let's go to bed and get a good night's sleep." Later that afternoon, Brain and his dad covered the front of their store with boards. "This will protect the ice cream shop," said his dad. That night, Brain measured the wind speeds with his anemometer. "110 kilometers an hour. Woo-hoo! This is amazing!" exclaimed Brain. As the hurricane blustered outside, Ladonna and her family played charades. When the phone rang, Ladonna's father answered it. He talked for a minute, then hung up. "The river is flooding. They need the Army Corps of Engineers down there. I need to go as soon as the winds die down." "Boy, I feel bad for the people who live down there," Ladonna said. Then she remembered something. "Will you be back in time for my birthday?" Her dad ruffled her hair. "I don’t know, but I'll try my hardest." 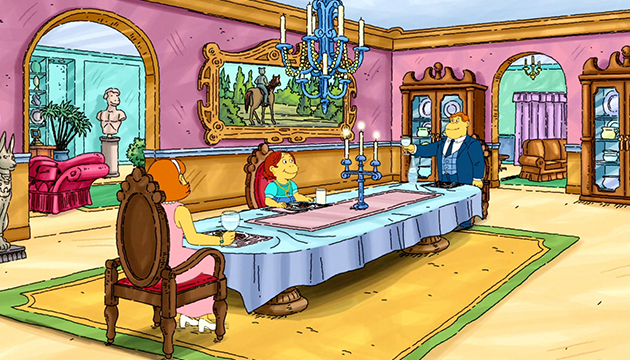 Muffy and her family were eating in their dining room. Outside, Hurricane Sadie was blowing. 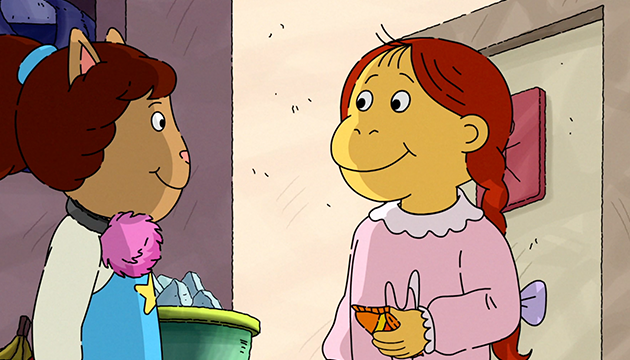 "I'm glad we're so prepared," said Muffy. "We have food and water." Just then, the lights went out. Bailey went outside and turned on the generator. The lights came back on. "And I am glad we are all together," said Mr. Crosswire, raising a toast. The next morning, the storm was over – but there were a lot of branches everywhere. Pal's dog house was damaged, too. 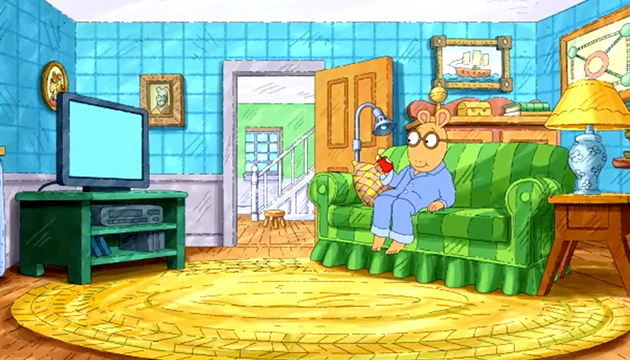 Arthur watched the news. "Elwood City avoided a direct hit," said the weatherman, "but some people near the river had to leave their homes – and even their pets." 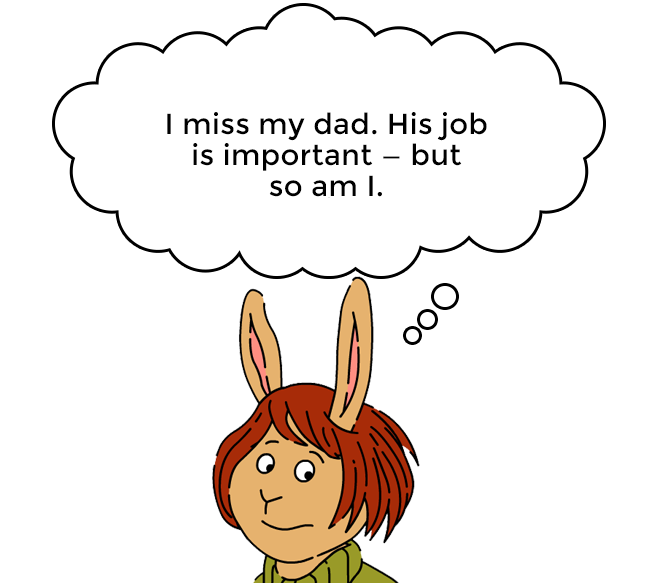 Arthur felt sad. He patted Pal. 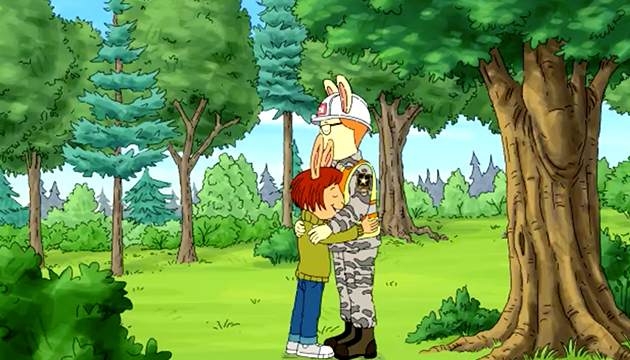 "I don't know what I'd do if I ever lost you," said Arthur. When Brain saw the ice cream shop in the morning, he was shocked! A large tree had crashed right through the front of the store. "But we were prepared!" said Brain. "Sometimes these things just happen," replied his dad. Later that night, at bedtime, Brain couldn't sleep. He was too worried. "What if a tree falls on our house?" he asked. "That's not going to happen," said his dad. "But you don't know that," said Brain. "Look what happened to our store!" The next day, Ladonna was walking with Bud. "You know, if Dad can't be home, I think I'll just skip my birthday this year," said Ladonna. Bud stopped walking. "But… that's against the laws of nature!" said Bud. "Nah," said Ladonna, "it's just another day." When they got home, Ladonna talked with her dad on a video call. "I'll try to be home in time for your birthday," he said, "but if it rains again, I might not–" Just then, the connection was lost. 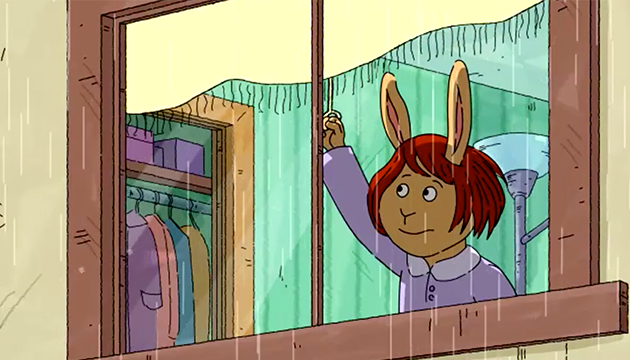 The next morning, when Muffy came downstairs, she saw that the storm had flooded the whole house! 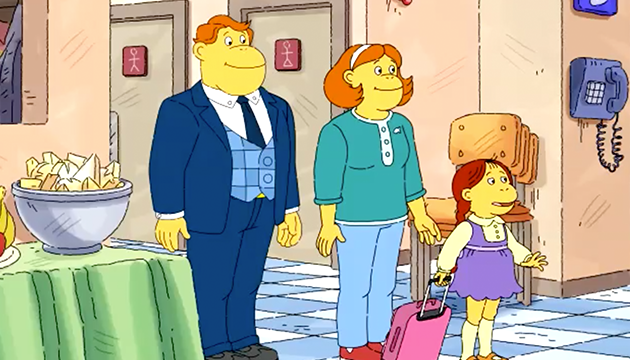 Muffy and her parents had to go to a hotel! But when they arrived, all the rooms were full. "Where will we stay?" asked Muffy. Mr. Crosswire said, "I know a place. It's not a fancy hotel, but there are lots of warm beds!" When they got there, Muffy looked around and gasped. "A shelter?" 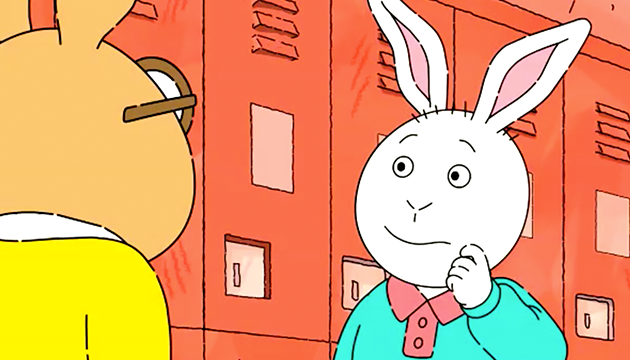 In school the next day, Arthur told Buster about the lost pets. 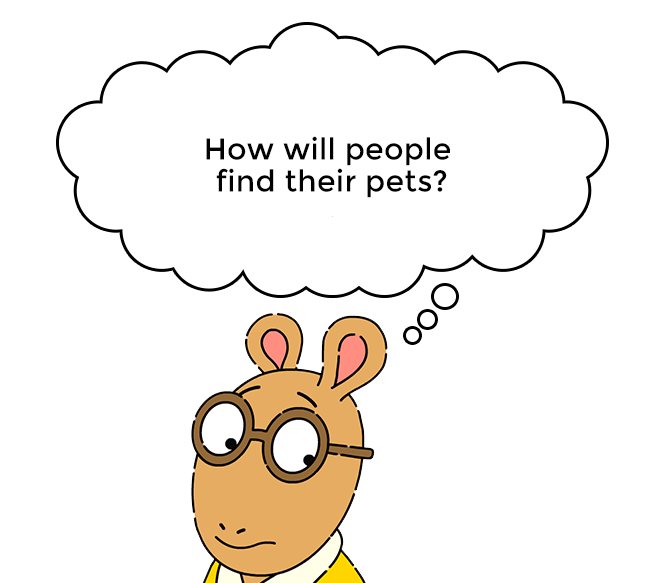 "I want to help those poor animals... but I don't know how," said Arthur. “You should call the animal shelter,” said Buster. “They help animals all the time. They'll tell you what to do." 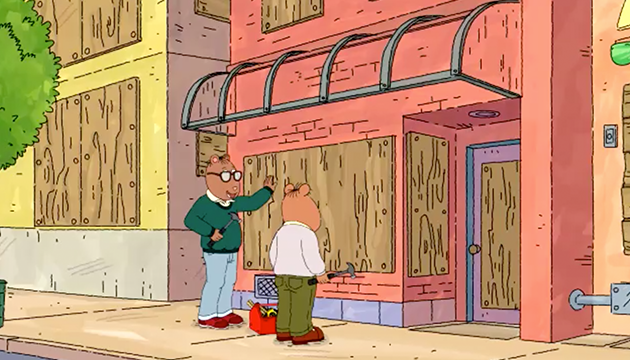 Arthur thought that was a great idea! When he got home, he called the local shelter. They told him that they were trying to return lost pets to their owners, but they were short on funds and needed more money. To help him feel better, Brain's parents took him to see a therapist – someone he could talk to about his feelings. "What was it like when you saw your shop after the hurricane?" asked Dr. Paula. Brain thought for a moment. "It was awful," he said. 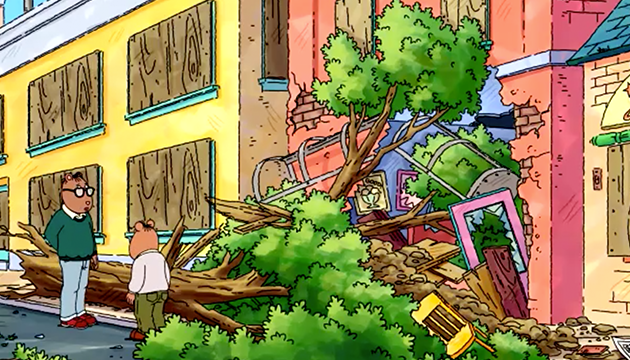 "We did everything we were supposed to, but a tree still crashed into our store!" "And was that kind of shocking?" asked Dr. Paula. "I don't know if I'll ever feel safe again," said Brain. "You will," said Dr. Paula. "It will just take some time. We’re going to work on this together." That night, Ladonna had a weird dream. Her parents were celebrating ALL of her birthdays at one time. And Christmas. And her high school graduation. 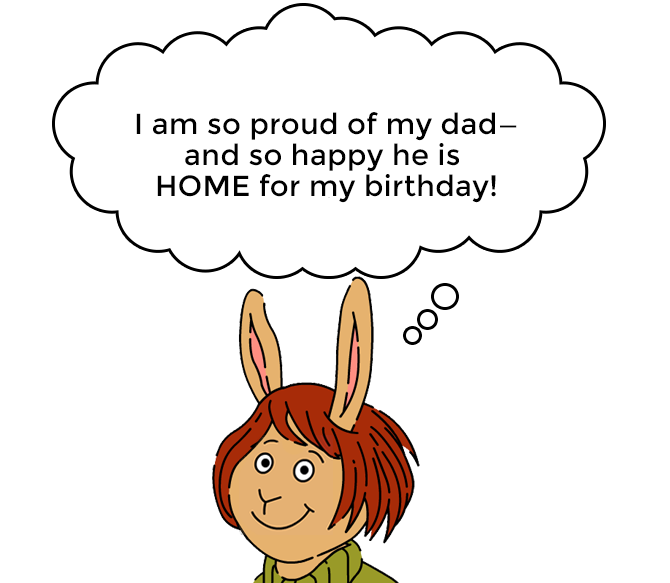 Then the phone rang, and her dad had to leave before they could even celebrate. "It's not fair!" yelled Ladonna...waking herself up from her dream. 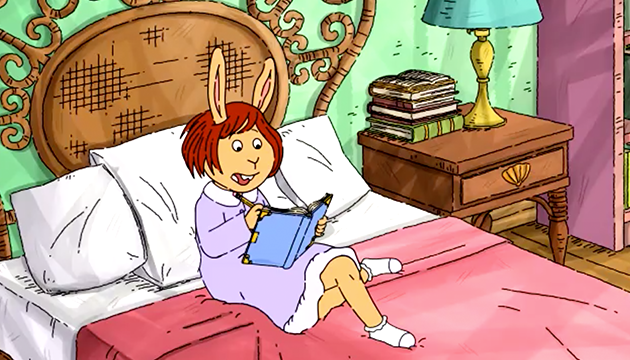 That night, Muffy tried to sleep – but she couldn't. She walked around a bit and found a snack table. She was reaching for a piece of cheese when she was interrupted by a voice. "I wouldn't eat that cheese if I were you – it tastes like glue. But the granola bars are really good!" 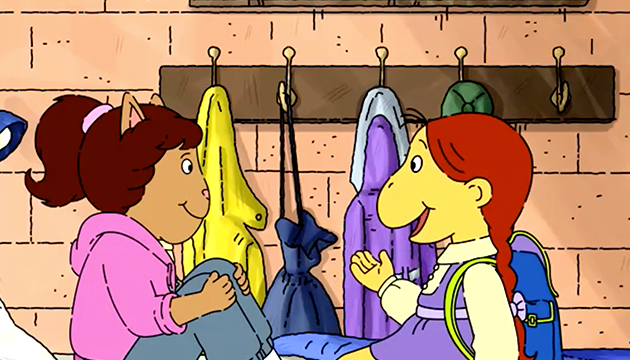 Muffy turned around to see a girl her own age. "Hi!" said the girl. “I’m Kaylie. 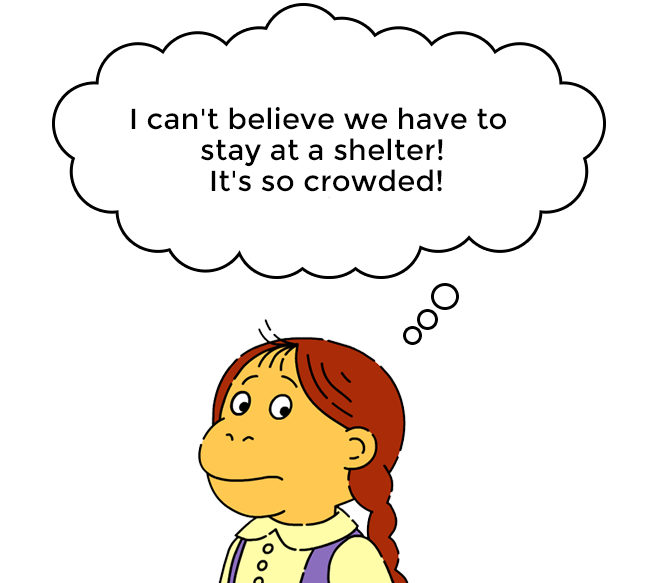 My mom and I were evacuated before the storm, so I know this place inside and out.” Muffy smiled. 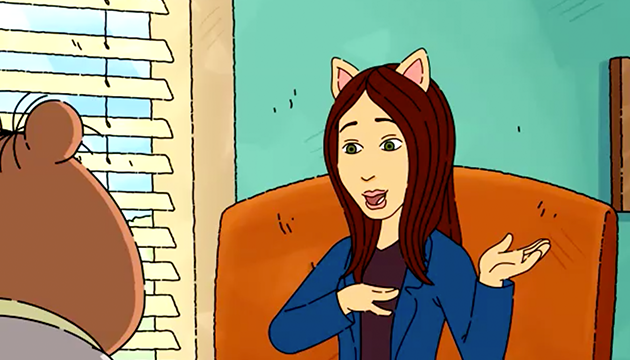 "I’m Muffy. Nice to meet you." The girls spent the rest of the evening together having fun and exploring the shelter. So Arthur asked his friends to donate money. Binky gave him a nickel. Francine gave him 50 cents. 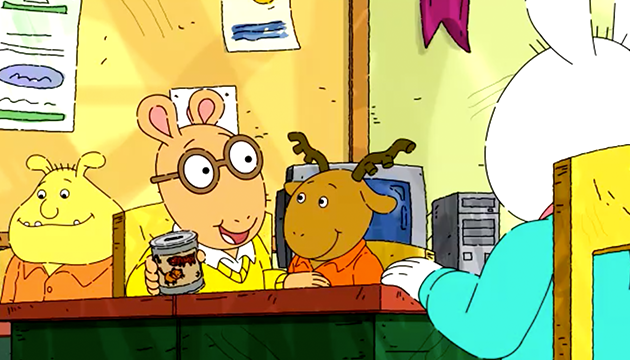 By the end of the day, Arthur had collected only $3.35. At home that night, Arthur sighed. "This isn't even enough money to help a tiny dog." 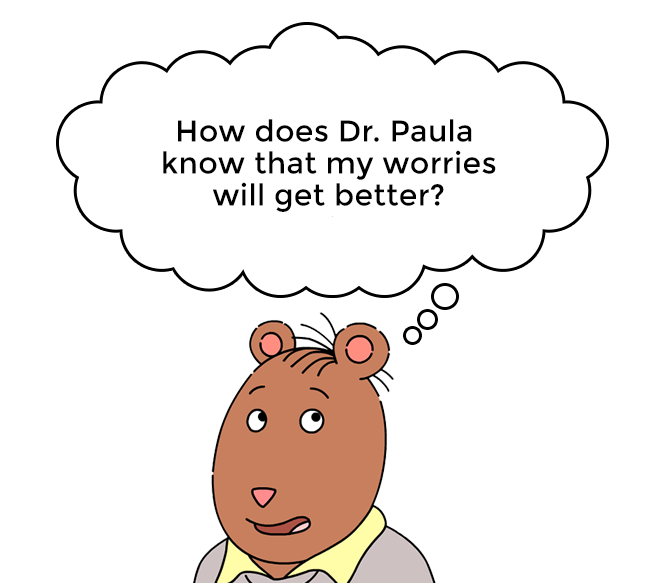 The next time Brain went to see Dr. Paula, she had some advice for him. "I'm going to teach you a special way to breathe when you get upset," she said, slowly breathing in and out. "Fear is like a bully in your head. When you focus on your breathing, you can stand up to that bullying fear." Brain took some deep breaths and let them out. "That's good!" said Dr. Paula. Later that night, Brain tried his deep breathing. But he was still worried. "It's not working," thought Brain. Ladonna got up and looked out the window. It was raining again. "Great. More rain," sighed Ladonna. "There goes any chance that Dad will be home in time." The next day, after school, Muffy found Kaylie again. "I can't believe I'm still here," said Muffy. "I miss my room, and my hot tub." "Well, my mom and I are going to look at our house,” said Kaylie. “We haven't seen it since the hurricane. Want to come?” When they got there, Muffy couldn't believe her eyes. Kaylie's house was destroyed. Kaylie and her mom were very upset. 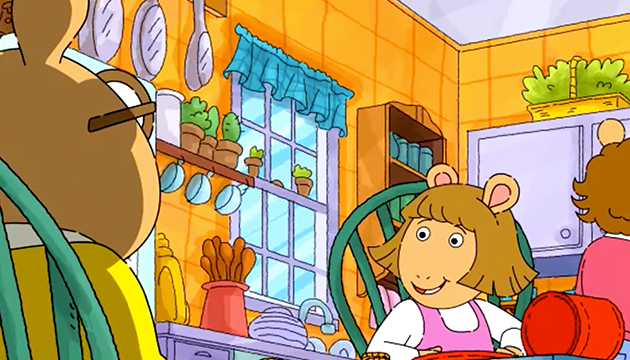 "I'm so sorry about your house," said Muffy. 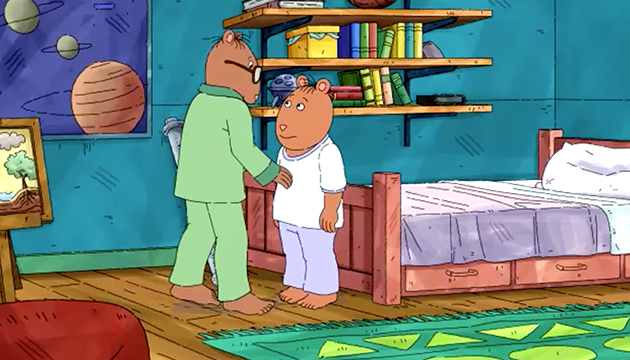 The next morning, D.W. had a good idea for Arthur. "You can't just ask people for money," she said. "You have to tell people a heartbreaking story!" 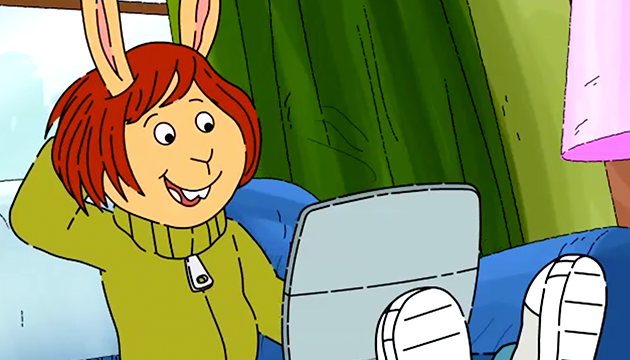 So Arthur and his mom searched the Internet. He searched for videos of people looking for their lost pets. Then he and his mom made a Web site where people could watch all the videos and make donations. "I think this is going to work!" said Arthur. In the morning, Brain told his dad he was still worried. "It can take time, Alan," he said. "You are the smartest and bravest person I know. You're going to beat this." The next day Ladonna wrote in her diary. "Today is my birthday. But Daddy's not here, so it won't be any fun." No one at school wished her a happy birthday – which made her kind of sad. Later that day, she bumped into Buster, who was carrying a bunch of boards. "The tree house was damaged in the storm. I'm going to fix it... but I don't know what I'm doing," said Buster. "That's okay," said Ladonna. "I can help you." 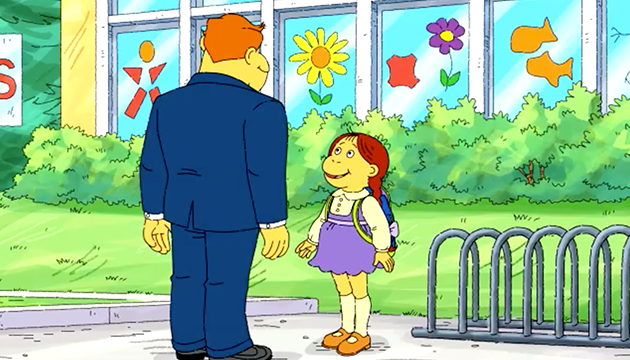 The next day, Mr. Crosswire picked Muffy up after school. "Our house is all fixed!" he said. "We're going home, Muffin!" 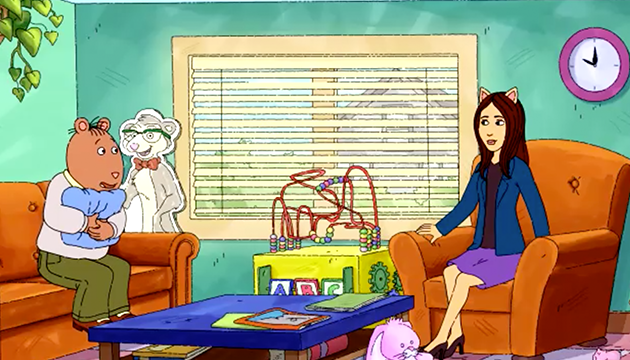 Muffy was very excited – but then she remembered how awful Kaylie's house looked. "Do you think Kaylie can stay with us until her house is fixed?" she asked her dad. Her dad smiled and nodded. It DID work! 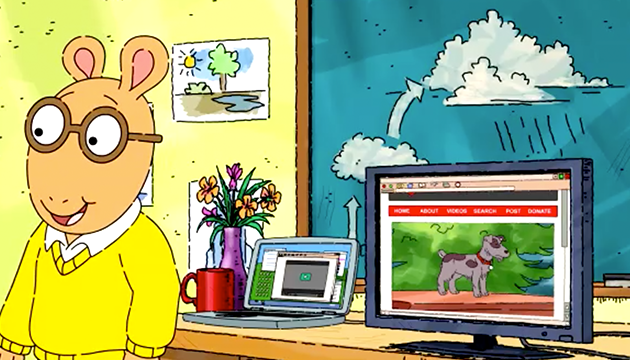 Arthur showed the Web site in Mr. Ratburn's class. They watched the videos of people looking for their lost pets. Everyone had tears in their eyes. And they all wanted to help! 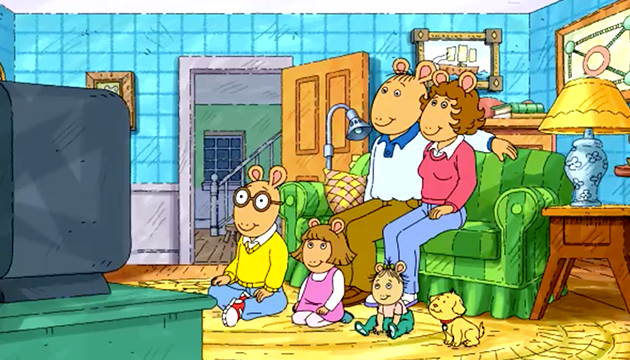 Arthur collected a lot of money for the shelter that day, from people all over Elwood City. 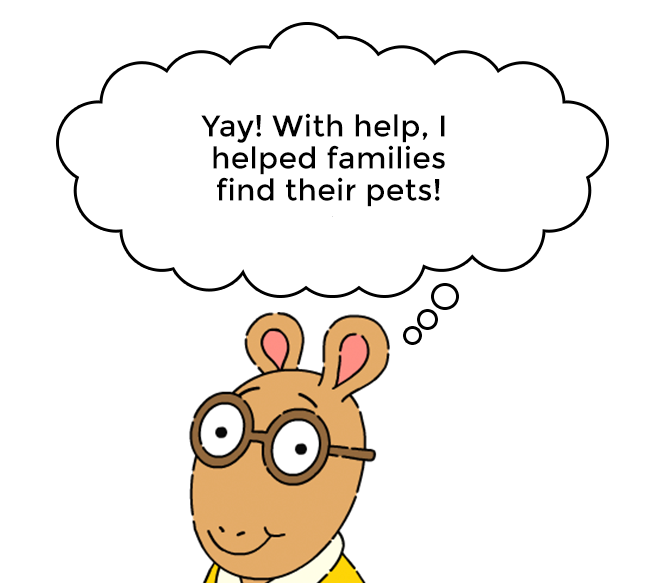 That made Arthur feel very helpful indeed. Later that afternoon, Brain went for a walk, even though the wind was blowing and the branches were swaying. Brain came to a tree in the woods. He took a deep breath, and spoke to the tree. "I'm smarter, stronger, and braver than you. You are NOT going to boss me around!" Brain stood and looked at the tree for a moment. He DID feel better! When they got to the tree house, all of Ladonna’s friends and family jumped out from behind the bushes. "Surprise!" they all yelled. Ladonna was very happy. Her brother Bud had told everyone it was her birthday. But without her dad there, it just didn't feel right. Then, suddenly, she saw someone walking toward her. It was her dad! He made it after all! "I can't stay too long," her dad said, hugging her, "but I wouldn't have missed this for the world." "This is the best present ever," said Ladonna. At the shelter, Muffy told Kaylie she could stay with them. "That's very sweet of you," said Kaylie, "but we're already going to my uncle's house." She paused. "But do you think we could be friends?" Muffy smiled. "After what we've been through? Of course!" 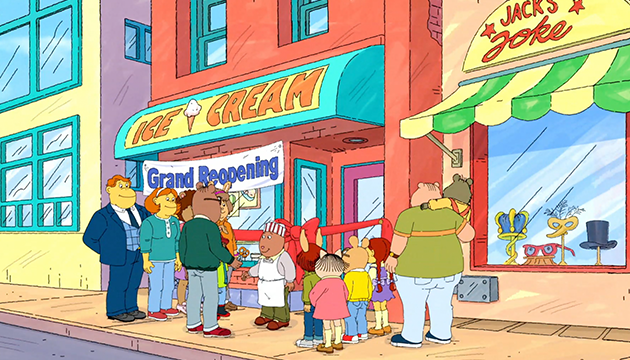 A few weeks later the ice cream shop reopened. It looked good as new! All of the friends were there enjoying some tasty snacks. Brain was busy making ice cream sundaes. Ladonna sat with Bud and her dad. 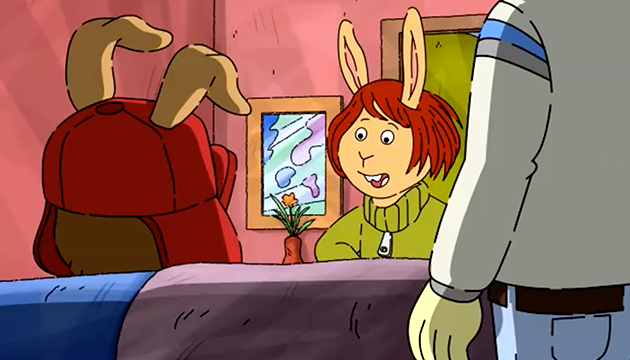 Muffy and Arthur were there, too. The hurricane had affected each of them in different ways, but they'd all learned that they could handle an emergency. And after everything they'd been through, the friends were happy to be together again!